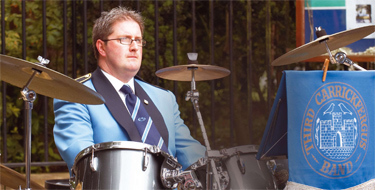 Principal percussion player with the band, Colin Watson, was recently the subject of an interview for "Expresslines" magazine which is published by Translink where Colin is employed as a Driver trainer/assessor. The transcript of the interview is shown below. Photographs and text are reproduced courtesy of "Expresslines" magazine. 1. When did you first start playing the drums? 2. What attracted you to drums over other instruments? My dad bought me a drum when I was sick with the measles, so I started playing while I was in the house, and the rest is history. 3. Did you have lessons or are you self taught? I taught myself to do most of it. 4. What kind of music do you play? Any favourites? I play a wide variety of music from classical music to modern pop and rock music. One of my favourite tunes has to be Bohemian Rhapsody by Freddie Mercury and Queen. 5. How many times a week would you practice? I practice with my band twice a week on Tuesday and Thursday nights. 6. Tell us a bit about the band that you play with. I play for 3rd Carrickfergus Silver Band, we are currently Irish Champions in our Grade, after winning the NIBA championships in the Ulster Hall in Belfast last October, and we will be defending our title this October in Armagh. The band is celebrating its 50th Anniversary in 2008, something every member is really looking forward to. 7. What 'gigs' do you have lined up for the summer? We have a very busy schedule over the summer months with concerts almost every weekend. 8. Would you recommend it as a hobby? If so why? Absolutely, it gives you the chance to get out and meet people and go to visit places that other hobbies may not let you. 9. What advice would you give to someone wanting to take up drumming? Go for it, you will really enjoy it. Listening to music helps you get used to different types of rhythms. Most importantly don't give up! 10. Who is your favourite drummer / musician and why? It would have to be Mark Knopfler the guitarist with Dire Straits; he's a really talented musician. Colin is a Driver Trainer/Assessor at Adelaide driver training centre.